James Nicholas Wagner was born at home in Austin, MN on April 18, 1933, to Nick and Margaret (Christie) Wagner, the 13thof 19 children. He graduated from St. Augustine High School in 1951, and attended St. Mary’s College in Winona, MN He enlisted in the US Navy and served from November 11, 1952 to October 10, 1956, spending most of the time on board the USS hornet and USS Yorktown. After completing his military service, he met Kay Finholdt and they were married on August 3, 1957 in Austin. Jim graduated from Winona State College in May of 1960 and his family moved back to Austin and Jim joined his father and brothers in their family business, Wagner Construction Company. Jim opened Oakdale Liquor in April of 1968 and moved his family to Owatonna in June. In 1980 he built BJ’s Bierstube, south of the Steele County Fairgrounds. Jim also enjoyed selling real estate and spent ten years developing Riverland Community College here in Owatonna. Upon retiring from Riverland, he became commissioner of the Fourth District of Steele County, a position he held for ten years. Jim’s first loves were his family and his faith. He loved the game of golf and was an armchair coach of the MN Twins and MN Vikings. For many years he was a member of the Owatonna Chamber of Commerce and was on of their ambassadors. 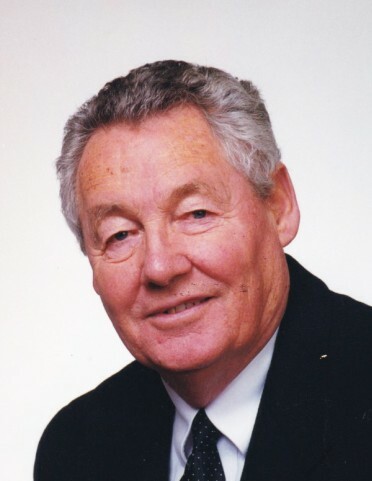 He was an active member of Sacred Heart Church, serving as a lector, a member of the Parish Council, Eucharistic Minister, and a member of St. Mary’s School Board. He taught seventh grade religion for ten years. Jim is survived by his wife, Kay, Son Jeffrey (Meaghan) Wagner, Chaska, MN; daughters, Jane (Kevin) Murphy, Bloomington, MN, Joanne (John) Pauley, Cannon Falls, MN, Angela Donlon, and Nancy (Troy) Evenson, Owatonna; grandchildren, James Wagner, Melanie Wagner, Nathan (Amanda) Morton, Claire Herber, Michael Pauley, Julia Pauley, Thomas Donlon II, Bernadette Donlon, Francis Donlon, Patrick Donlon, Daniel Donlon, Laurel Stewart, Kelsey (Dillin) Schultz, Anthony Stewart, Thomas Evenson, Chelsea Evenson, Tanner Evenson and Jack Evenson; great-grandchildren, Peyton and Andi Schultz, Westin Craft, and Charlotte Morton; sisters, Jeanne Hermanson, Barbara Burke and Gretchen McNamara of Hastings, MN; sisters-in-law, Judith Ferguson, Austin, MN, Lyndel Finholdt, Owatonna, Elaine Wagner and Sandra Hentges, Austin, MN; brothers-in-law, Edward Hangge of Marine-on-St. Croix, MN, Jerry Nelson, Columbia, MO, Michael Ferguson, Austin, MN, Kenneth Finholdt, Owatonna; numerous nieces and nephews. Mass of Christian burial will be held at 11:00 AM Tuesday, November 27, 2018, at Sacred Heart Church, Owatonna, with burial to follow at Sacred Heart Cemetery. Friends may greet the family at 9:00 AM prior to the funeral at church. Military rites will be provided by the Steele County Funeral Unit. In Lieu of flowers memorials are preferred to Steele County Hospice Patient Care Fund, Sacred Heart Church or the Steele County Alzheimer’s Association.